Today is Apple Watch D-Day for a speedy few early adopters, with Cupertino finally shipping the first batch of its debut wearable to buyers. That means it’s also the day that serial repairers/tenacious teardowners iFixit get to crack open Apple’s latest sealed box and peer inside so we don’t have to. Their teardown of a 38mm Apple Watch Sport and a 42mm Apple Watch steel are currently in progress — you can follow the painfully detailed dissection here. One nugget of intel they’ve managed to prise out of the back of the dinky wrist computer so far is that Apple is not making it easy to swap out the S1 processor chip that powers the watch. That may sound pretty obvious but there have been suggestions Apple could offer an upgrade program for the Watch — offering processor upgrades as a way for the smartwatch to stand the test of time vs less smart (but more long-lived) luxury watches with which it competes for wrist real-estate. However iFixit’s findings suggest those rumors are wide of the mark (albeit, this finding relates specifically to the lowest priced Apple Watch Sport model). 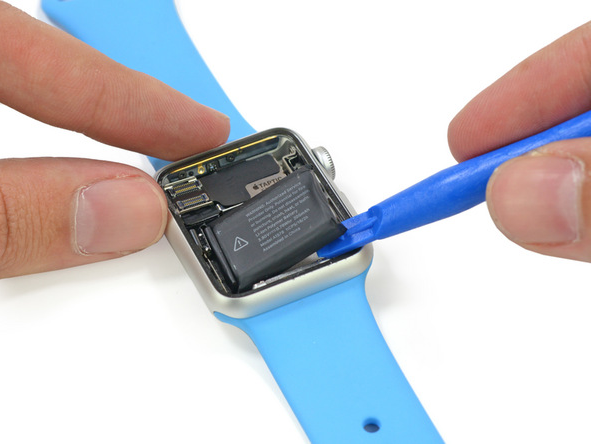 Getting to the Watch’s S1 processor took iFixit 20 steps. And required some “destructive procedure”, as they term it — aka ripping out soldering. “Despite rumors (and hopes) of an upgradable product — the difficulty of removing the S1 alone casts serious doubt on the idea of simply swapping out the internals,” they note. The Apple Watch’s S1 chip is also encased in what they describe as “a solid block of plasticky resin” — presumably to make curious teardowners like iFixit work harder for component intel. In contrast to its silence on the sealed away S1, Apple has previously confirmed to TechCrunch that the Apple Watch’s battery will be replaceable. And iFixit’s teardown bears that out — showing it’s far simpler (and non-destructive) to get to the battery to replace it. After lifting and disconnecting the display to get to the guts, they’re able to flick the battery out — by step 11 in their teardown — liberating it from what they say is only “light adhesive” securing it in place. TechCrunch understands the lifecycle of the Apple Watch battery is pegged at around three years. But if there’s no avenue for swapping out and upgrading the internals at the same time, users may well be pushed towards a wholesale device upgrade in order to get the next-gen processor.